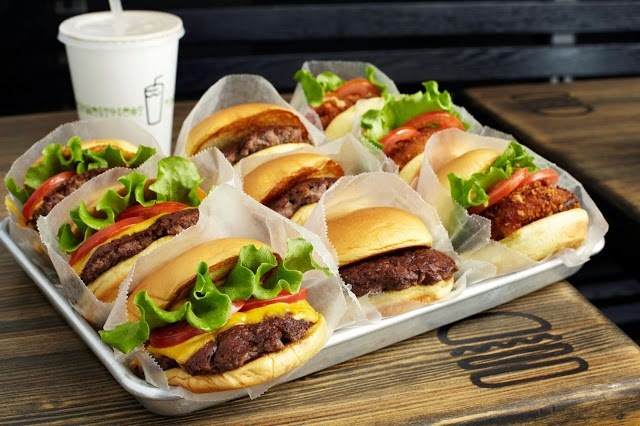 The magic, and downright moreishness of Shake Shack’s appeal lies in the absolutely fastidious attention to detail, which manifests in itself in the presentation of the food on your plate. It’s an impressive feat for, what is ostensibly a fast food burger joint, to bang out such consistency at the counter. And it’s the colours that make the burgers so mouth-watering – the shiny yellow/brown of the bun enticingly open like a clam shell in its burger pouch. The bright green leaf of lettuce, exactly arranged to show off the waves of the curvy leaf. The double slice of deep red tomato, meticulously cut into almost impossibly uniform widths. The bright, almost neon, yellow American cheese, seemingly symbiotic with the beef. And the seared 4oz burger patties, dark brown with caramelisation as the heart of the burger. It’s all so damn…appealing. There’s also chemistry, nay, alchemy in how the ingredients work together. The burgers are like crack. And that’s why I keep coming back. 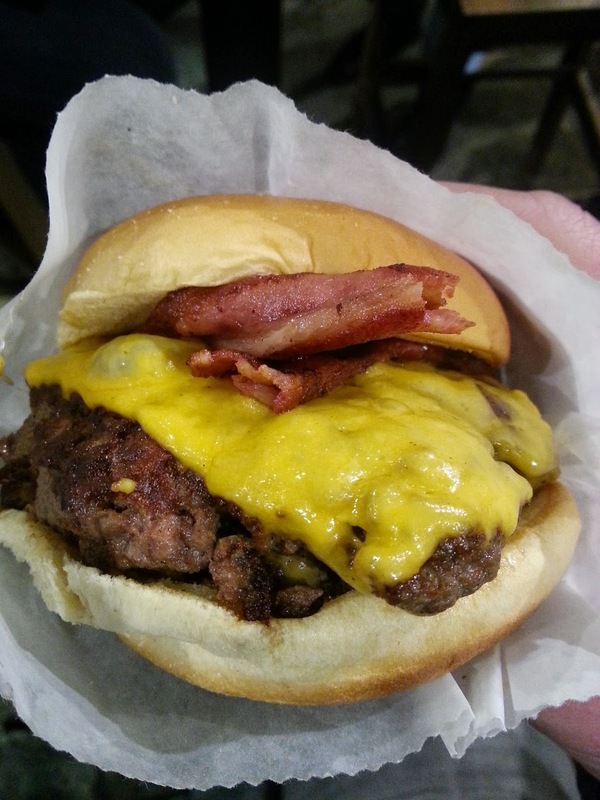 Patty – shake shack’s beef is from grass fed Aberdeen Angus cattle raised on Scottish pastures. They used a proprietary ‘shack blend’ for their 4oz burgers, and as analysed by Serious Eats, this appears to feature cuts from the chuck, brisket and sirloin – this sounds about right as the beef is meltingly soft with a deep, earthy flavour. The fresh beef patty is seasoned with salt and ‘smashed’ onto the flat top grill, where it is left for a couple of minutes to form a caramelised crust – which happens as the fat and the beef sear together and seal the juice into the burger patty. The seasoning in the crust becomes magnified along with a slightly sweet caramelisation which beautifully complements the beef. 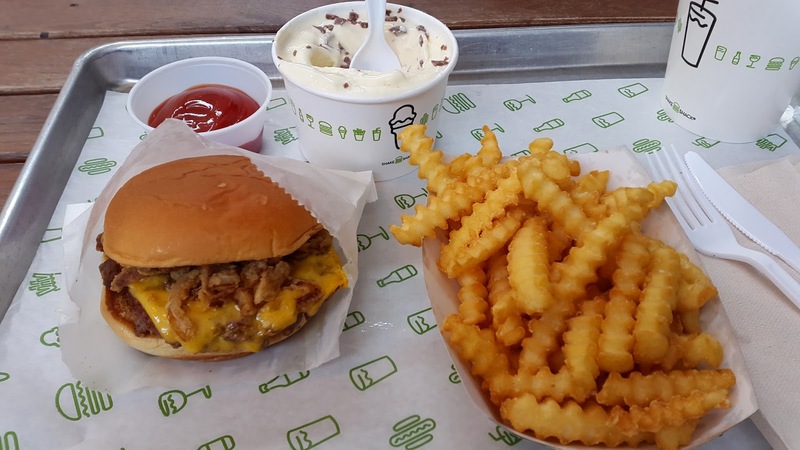 Cheese – the cheese used at Shake shack is a mild American sliced variety, importantly with a low melting point which makes it perfect for hugging a freshly cooked burger. The low melting point also benefits the chemistry of the burger as when it melts it becomes super-sticky and melds to the patty which locks in those juices. The cheese is added to the freshly seared side of the burger just after it’s flipped on the grill. It’s then left to slowly melt as the other side of the burger cooks. Bun – A potato based roll. This bun is super soft and squishy but with a backbone of steel which stops it collapsing and covering the diner in bits of burger and sauce. The bun is toasted lightly on the inside before being lightly buttered and loaded with the rest of the ingredients. 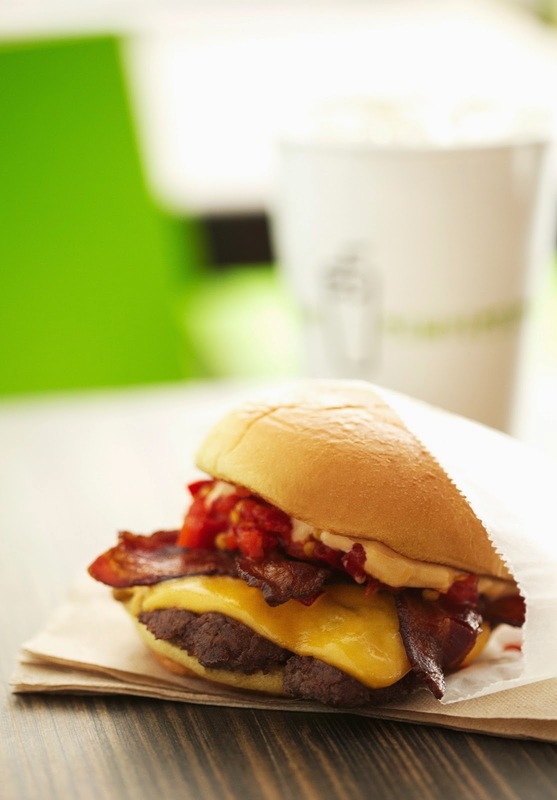 Shack Sauce – A house-blended condiment that Shake Shack describe as a tangy mayonnaise. The sauce is rumoured to combine mayonnaise with gherkins, and the creation can be described as ‘mix, blitz, squeeze’. 'Shroom – the Shack ‘Shroom is deep fried pleasure at its most indulgent. Essentially a deep fried, breaded Portobello mushroom filled with cheese. The mushroom is topped with American cheese and then rolled in breadcrumbs before being deep fried until golden and the cheese inside is a molten pool of joy. The Shake Shack cheeseburger is a simple combination of their smashed 4oz patty topped with American cheese, wrapped in a potato roll. And it’s absolute classic nostalgia food – like those cheeseburgers you used to eat at McDonalds when you were younger, but supercharged with great, well-sourced ingredients. It literally melts in your mouth in a mass of savoury-sweet buttery joy. In fact it’s so good you’ll find it hard not to order another one immediately, so for that reason I always order a double. With bacon. 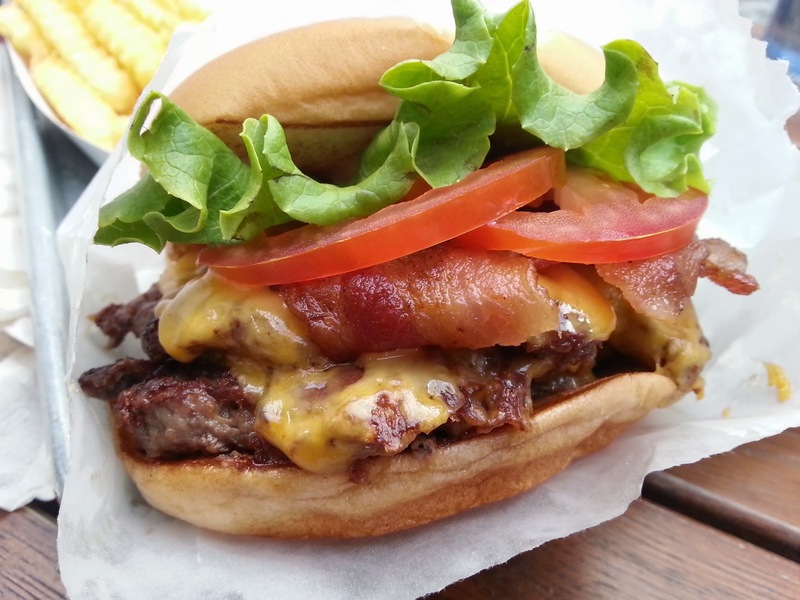 This is Shake Shack’s, and arguably it’s most photogenic. This burger combines the smashed Aberdeen Angus 4oz patty, melted American cheese and ShackSauce and layers a bright green leaf of curly lettuce and two slices of tomato on top, all wrapped in the soft squishy potato roll. And fear not, it tastes as good as it looks – the tomato and shack sauce combining to add acidity to the buttery mellow flavours of the beef and bun. Double up on this one for extra satisfaction. 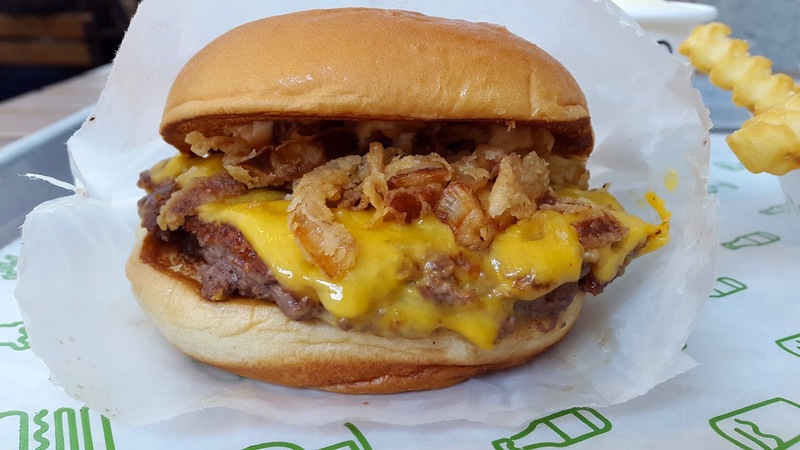 This is a relatively new addition to the Shake Shack Menu in Covent Garden and combines the shack patty, sauce, american cheese and a heap of ShackMeister Ale marinated, crispy shallots. It has a great depth of beefy flavour with overtones of steak and ale pie - and the crispness of the shallots add a great contrast to the softness of the other ingredients. It's pretty darn good. 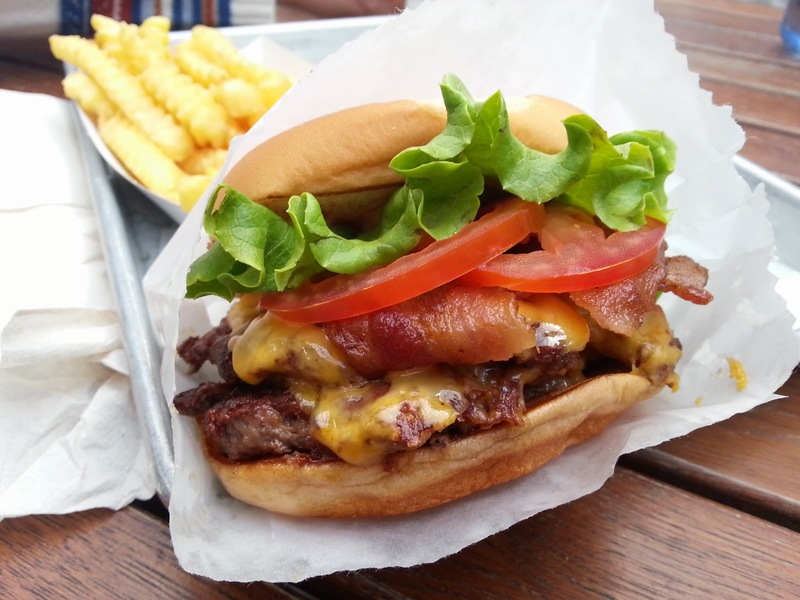 The Shack Shack bacon cheeseburger. It delivers fantastic flavours of smoked, cured and griddled rashers of free range Wiltshire bacon, and a sweet-sharp combination of chopped pepper and ShackSauce – all added to the standard cheeseburger. Big flavours and fantastic bacon mean this burger delivers on a number of levels. The Shake Shack vegetarian option. This is effectively the Shack Burger, but switch out the glorious beef patty and replace it with the breaded and cheese-filled Portobello mushroom patty. The breadcrumb crunch adds a great dimension to the softness of the rest of the ingredients, too. With this burger, someone had a great idea. They said “If we take the Shack Burger and then throw in the deep-fried Portobello mushroom from the ‘Shroom burger, what would we get?” The answer, of course is the Shack Stack. This burger combines the beef/cheese/sauce/salad combo of the Shack burger and adds that glorious deep fried, breaded, cheese-filled Portobello mushroom patty into the sandwich for maximum effect. It’s big, it’s bad, and it’s a particular favourite guilty pleasure of mine…no sides needed. 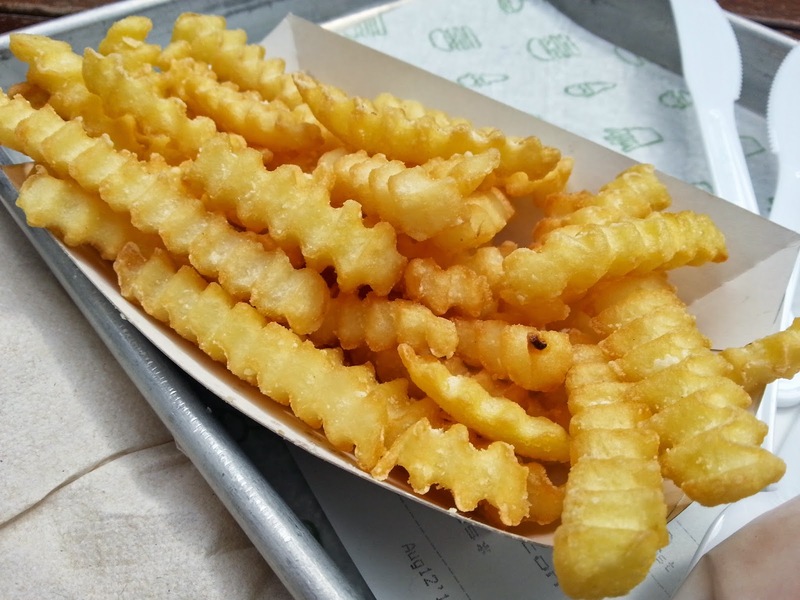 Crunchy crinkle cut fries, with or without shack cheese sauce. It's like you're at a kids birthday party...but with cheese sauce. I realise this guide purely focuses on the burgers and fries - while historically Shack Shack started as a hot dog stand in Madison Square Park, and do a fine range of concretes, shakes, beers and wines - the burgers are so damn good they're what I'm most interested in! I'm sorely tempted and know I might well, but I just took a look at the menu to check out the prices and ouch! Maybe it's me (and if it is, just say so), but you go on a date or, worse, take the family and this quickly becomes an expensive proposition for what is essentially fast food. Maybe it's the location, but even so, ouch. Now i'm beginning to seriously worry about your arteries. you're very found of bluebell the cow in the bun. Do you wander around a field with cutlery in hand, er ? Cows are simply burgers and steak I am yet to eat! I have nothing against red snapper or octopus tentacles in butter or garlic, nothing in the least, But they do need to be in a bun and topped with cheese and bacon! Bulls's testicles, prairie oysters, bring 'em on; same conditions apply, though. 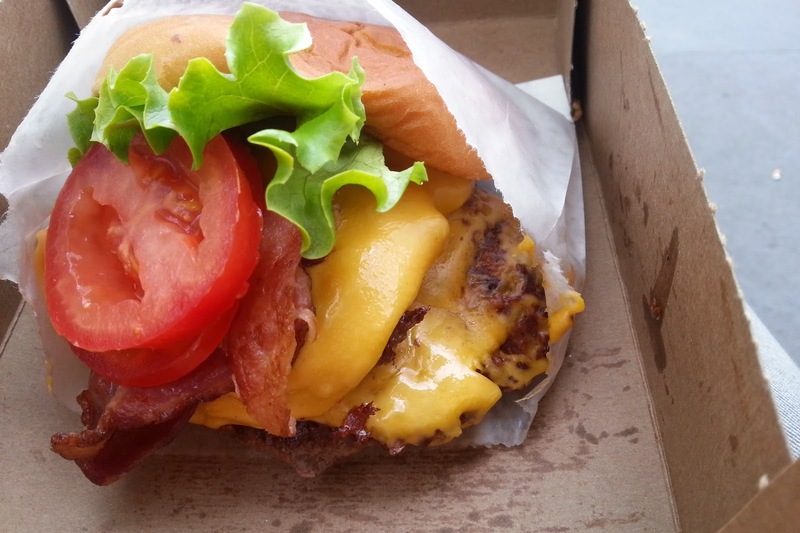 I did find Shakeshack tasty but with you on the prices. It's a very fast food experience but the prices arent fast food prices. 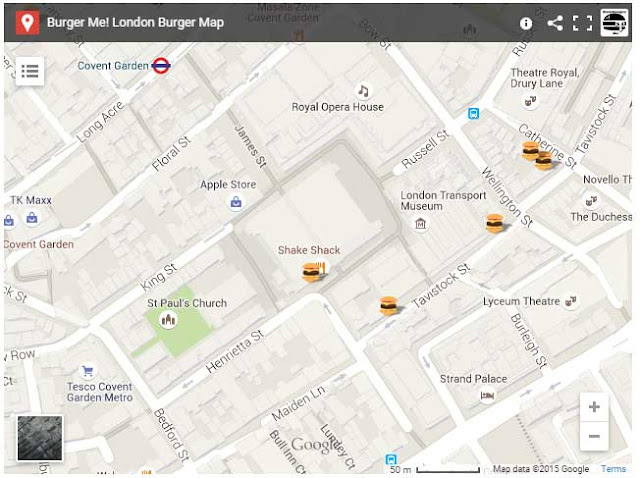 It's a great business model for the owners and fair enough, they can't give the stuff away, but you put together a decent burger, fries and a drink and they are in proper restaurant territory or even well above considering not everybody lives in London's Covent Garden. Or maybe this is cheap by the area's standards. But look at the picture of those fries, that is what? Maybe two or three potatoes at most.